Welcome to California's best River Rafting! Beyond Limits Adventures offers whitewater rafting tours on three forks of the American River and Yuba River. Raft with us and see why we are considering the best company in the west! Rated #1 Whitewater Rafting Trip in California by Trip Advisor! Our 2019 season starts later this month, start planning your river adventure TODAY! Beyond Limits Adventures is the number one whitewater rafting outfitter on the American River. We've been rafting the 3 forks of the American River for more than 38 years. Our trips are fun for everyone... first timers and veteran rafters alike will have the time of their lives on the American River! We are the perfect outdoor activity for families, company outings and special events of all types! Discover fun rafting things to do like "surfing" and "riding the bull"! Learn about the interesting river history of the Coloma area and California's Gold Rush. Go Pro video cameras are on board our rafts and you can view the spectacular footage after your trip! Beyond Limits Adventures provides GoPro cameras on all of our rafts! We are rated as the #1 rafting company on the American River... here's why! We keep our trips smaller and more personable than other outfits do. Groups of 6 or more per raft is a perfect size for our trips! Our river guides enjoy our working environment and have the personality and skills to make your trip truly special. Our spacious private riverfront resort is never crowded which makes our overnight trips truly memorable and enjoyable. We're old school... we believe that a day on the river should be relaxing and fun. Our trips are designed to keep you away from the crowds. Reservations are required but last minute bookings are also possible. Start planning your Beyond Limits rafting adventure here! Our Top 4 Whitewater Rafting Trips for Spring 2019! Private areas for swimming and sunbathing. Uncrowded places to camp and relax. Evening campfire next to the river for your enjoyment! Camp store with ice cold beer on tap and local wines for sale. Bring your own camping equipment or rent a cabin tent or yurt from us during your stay! Camping and meals are included our 1 day overnighter and 2 day South Fork American rafting trips! Due to massive amounts of snow in the high Sierra, The South Fork American River will have high water during spring snow melt in the months of April, May and June. From July through September we will have guaranteed normal water flows and fun rapids 7 days per week! South Fork American - Class 3 (no experience required). recommended for ages 10 and above in Springtime and 7 and above during the summer. A 2 to 3 hour trip filled with interesting Gold Rush history and a unique volcanic canyon. The best time to raft the Stanislaus River is April, May and June... book your trip today! 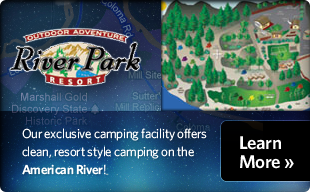 Check out our last minute discounts for the best rates on the South Fork of the American River. it. After the rafting, we stayed for the night at the Beyond Limits campground, by the river. Very relaxing, with some gold panning and swimming. We highly recommend!